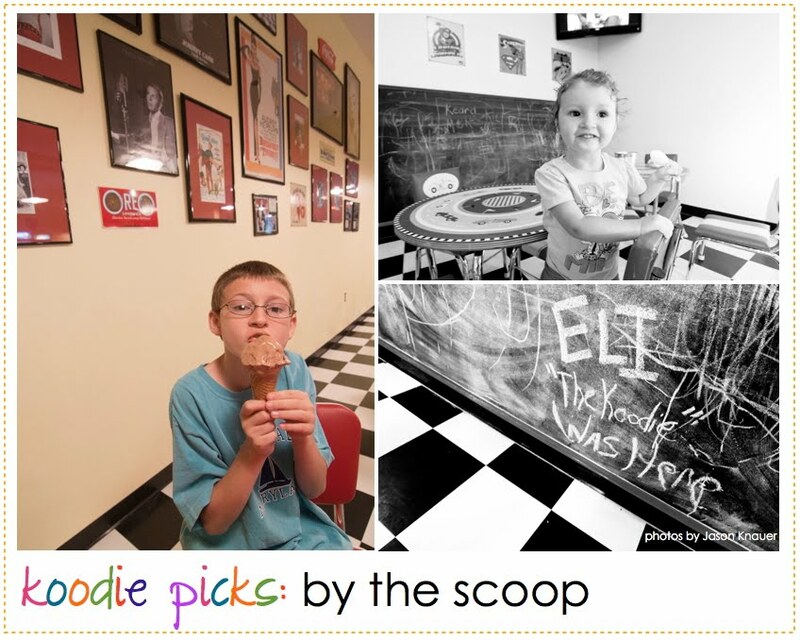 Here is my review of By The Scoop for Cool Progeny. Guess what! I was named Best Up-and-Coming Food Blogger by Baltimore Magazine! 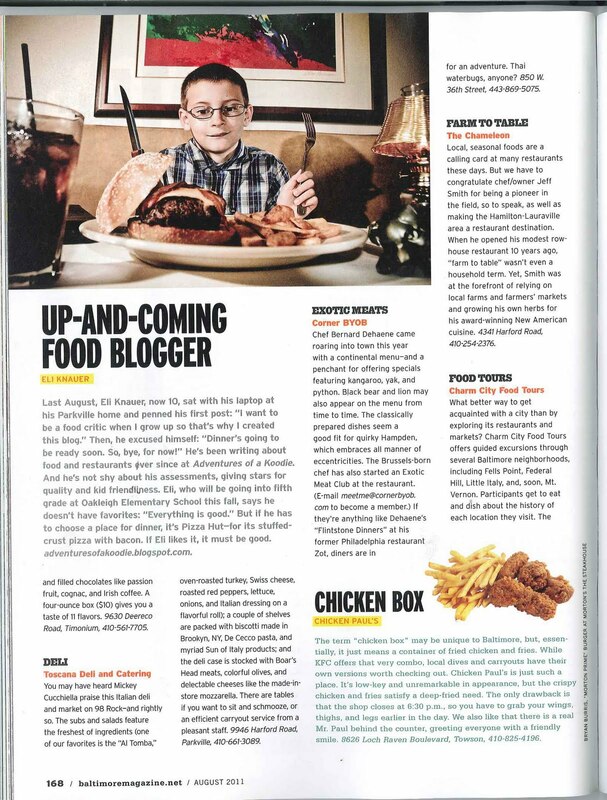 I am on page 168 in the magazine. I went to a place called The Abby Burger Bistro. When I walked in, I saw that it was a bar and the first thing I smelled was beer. I then realized that at the back were four tables. And I saw wide screen TVs in front of every table. When we sat down, the waitress poured all of us a glass of water, and then left. When I looked at the menu, I was pretty surprised. They had stuff like alligator bites and waffle fry nachos. They also had some meats which I've never tasted like ostrich, elk, bison, and kangaroo. 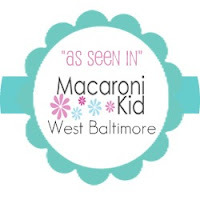 They also had a kids meal with foods like mac'n'cheese and kids sliders, though I heard that there burgers where good,so I wanted to have one. Another problem was that there was only four choices on the kids menu! But there was also activity's like mazes and a treasure hunt on the menu. If you don't order from the kids menu, you can always build-a-burger. You get a checklist and you check off the meat, cheeses and other things that you want. There were two meats of the month and they were duck and kangaroo. Since I never tried kangaroo before, I decided to have it. I also had gran queso (a type of cheese) and BBQ sauce. 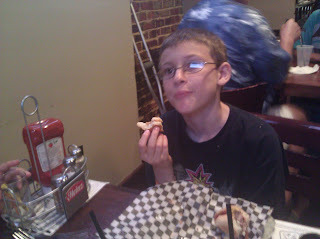 When I got my burger, it had a olive on a stick and homemade chips. Since I don't like olives, I gave that to my mom. 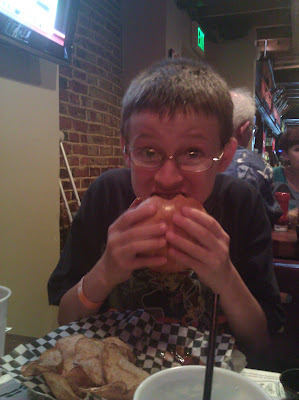 My first bite of the burger was delicious! The BBQ sauce had lots of flavor, though I couldn't taste the cheese and the kangaroo meat had a seafood type of taste. The chips were crunchy and salty which made them taste fantastic. 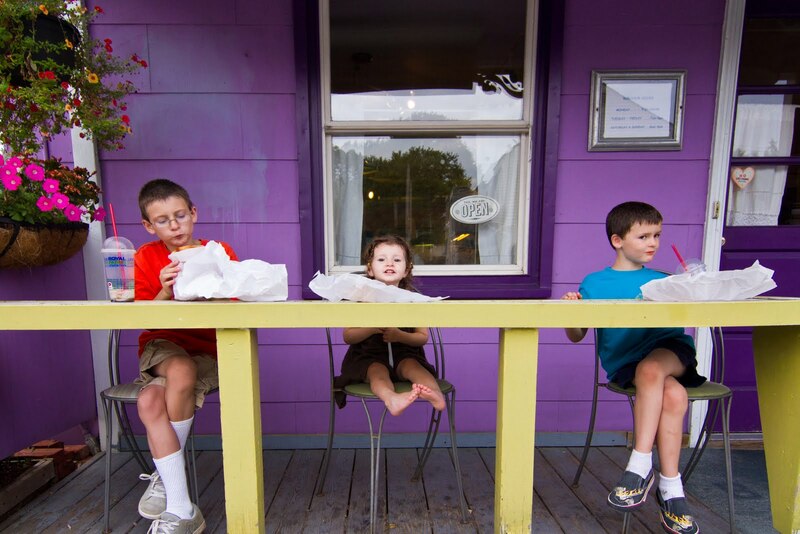 I give food ***1/2 stars for food and **1/2 stars for kid friendly. Well, that's all. Bye! 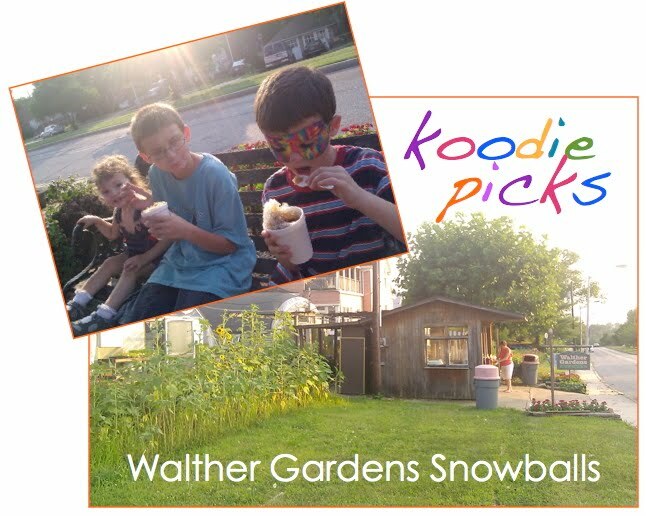 Here is my review of Walther's Gardens Snowballs for Cool Progeny. This is Eli's mom. We had a busy weekend and Eli didn't have a chance to link to his latest review on Cool Progeny of Prigel Family Creamery in Glen Arm. Check it out! On Wednesday I went to a place Called the Haute Dog Carte, which is a hotdog cart that doesn't move. 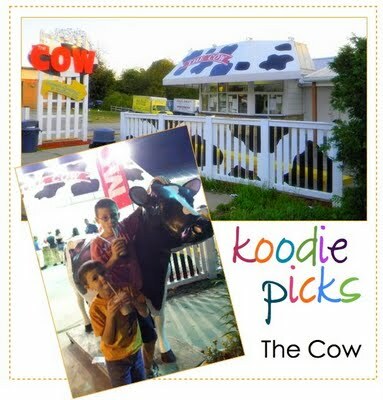 When I got there, there was a short line at their little tent. There was a little choice, and there were only two hot dogs which would be kid friendly! They where HD signature and Chef Dogs! Though the hot dogs were huge, so it is a adult place.I was really interested in how they prepared the bun. First, they take out a hotdog roll. Next, they put it on this thing which splits them in half. Last, they take it of and comes out toasted! I got a chef dog, which was Smokey Mountain sausage. I got it with BBQ sauce and bacon marmalade. It was delicious! There was also a lot of bun. It was so big I had to take half of it home! The marmalade made it much better. Though there wasn't a lot of BBQ sauce. The bun was very soft, and because of the marmalade I didn't taste much of the smoked sausage. I give *** stars for kid friendly and *** stars for food. Well, that's all.Bye! I was interviewed by a blog in Brazil. Elijah Knauer, de dez anos, o pequeno americano de Baltimore, vem fazendo sucesso nos Estados Unidos como crítico gastronômico mirim. Elijah Knauer, ten years, the small American from Baltimore, has been doing successfully in the United States as a food critic mirim. Com o seu blog, “Adventures of a Koodie” (Aventuras de um garoto interessado em comida, na tradução literal) ele já avaliou mais de 50 restaurantes. 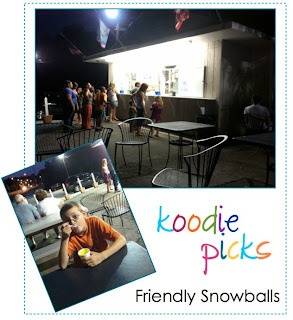 With his blog, "Adventures of a koodie" (Adventures of a boy interested in food, in literal translation) he has evaluated more than 50 restaurants. Ele inclusive já concedeu diversas entrevistas para as rádios e redes de televisão nos Estados Unidos. He even has granted several interviews to radio and television networks in the United States. E o Nossa Cozinha não ficou de fora dessa! And our kitchen was not out of this! Entrevistamos o Elijah por e-mail e ele parece um garotinho muito inteligente e simpático. Elijah interviewed by email and he seems a very intelligent and friendly boy. Nossa Cozinha – Como surgiu a ideia do blog? 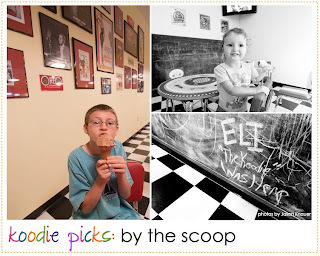 Our Kitchen - How did the idea of the blog? Elijah – Tudo começou enquanto estava de férias no Canadá. Estava pensando em o que eu gostaria de ser quando crescer.Queria um trabalho que incluísse comida ea primeira coisa que surgiu na minha cabeça foi um crítico gastronômico. Então eu contei para a minha mãe que queria ser um crítico quando crescesse e ela disse que eu precisava primeiro de um blog. 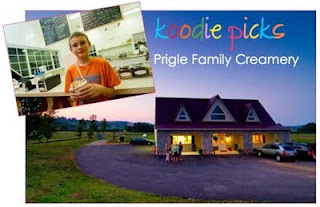 It all began while vacationing in Canada. I was thinking about what I want to be when you grow up. I wanted a job that included food and the first thing that popped into my head was a food critic. So I told my mother he wanted to be a critic when I grew up and she said I first needed a blog. Nossa Cozinha – Seus pais ajudam você a escrever o blog? Our Kitchen - Your parents help you write the blog? Elijah – Eles me ajudam a publicar e adicionam coisas que eu esqueço de colocar. They help me to publish and add things I forgot to ask. Nossa Cozinha – Você parece uma criança bastante esperta. Como você cria seus posts? Você planeja os restaurantes em que deseja ir? Our Kitchen - You seem a very smart child. As you create your posts? You plan the restaurants you want to go? Elijah – Eu crio meus posts fazendo as críticas pela ordem do menu. E eu adiciono algumas memórias da viagem. Nem sempre eu planejo os restaurantes em que vou. Meu pai e minha mãe me ajudam a escolhê-los. I create my posts by making the critical order of the menu. And I add some memories of the trip. I do not always plan the restaurants I go. My father and my mother helped me to choose them. Nossa Cozinha – Até agora, qual foi seu restaurante favorito? Our Kitchen - So far, what was your favorite restaurant? Nossa Cozinha – Qual a sua comida favorita? Our Kitchen - What is your favorite food? Elijah – Minha comida favorita é pizza de bacon. My favorite food is pizza with bacon. Nossa Cozinha – Quando não está escrevendo em seu blog, o que você gosta de fazer? Our Kitchen - When not writing on his blog, what you enjoy doing? Elijah - Gosto de jogar Pokemon no meu videogame. Gosto também de ler. Meus livros favoritos são os do Harry Potter. I like to play Pokemon in my game. I also like to read. My favorite books are Harry Potter. Nossa Cozinha – Você já aprendeu a cozinhar alguma coisa? Se sim, como foi? Our Kitchen - You've learned to cook something? If yes, how was it? Elijah – Sim, aprendi. Aprendi a cozinhar hambúrgueres e café da manhã. Ficou delicioso! Yes, I learned. I learned to cook burgers and breakfast. It was delicious! Nossa Cozinha – O que você quer ser quando crescer? Você quer abrir um restaurante algum dia? Our Kitchen - What do you want to be when you grow up? You want to open a restaurant someday? Elijah - Na verdade, eu já mudei de ideia. Agora quero ser engenheiro de alimentos, mas ainda escrever no meu blog como hobby. Se esse plano falhar, quero abrir um restaurante de frutos do mar. Actually, I've changed my mind. Now I want to be an engineer of food, but still write in my blog as a hobby. If this plan fails, I want to open a restaurant seafood. Nossa Cozinha – Você quer dizer alguma coisa para as pessoas do Brasil que estão lendo esta entrevista? Our Kitchen - You mean something to people in Brazil who are reading this interview? Elijah – Sim. Continue lendo meu blog para mais posts fantásticos! Yes Read my blog for more great posts! On Thursday after Vacation Bible School at church I went to the Towson farmers market with my dad, my brother, Owen, and my sister Olivia, to get some groceries. The farmers market has vegetables like carrots and candy apple onion, and fruits like blueberries and sweet cherries. We also hadn't had lunch, so my dad suggested we go to the Empanada stand. They also have a restaurant version called Max's Empanadas. While we where going there, we saw the stand which has a truck version of it. It was Dangerously Delicious! Though my dad said we would get the pies they had after lunch. When we got to the stand, I saw Empanadas. An Empanada looked like a small pie with different types of fillings. They had Ham and cheese and chicken Empanadas. We all had the Chorizo Empanada, which is sausage, sun dried tomato, walnut, and mozzarella. 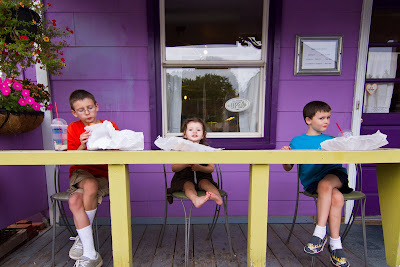 Since there were no tables or chairs, we went inside a store, Ridgely and Ferrens Markeplace, where you can eat in. 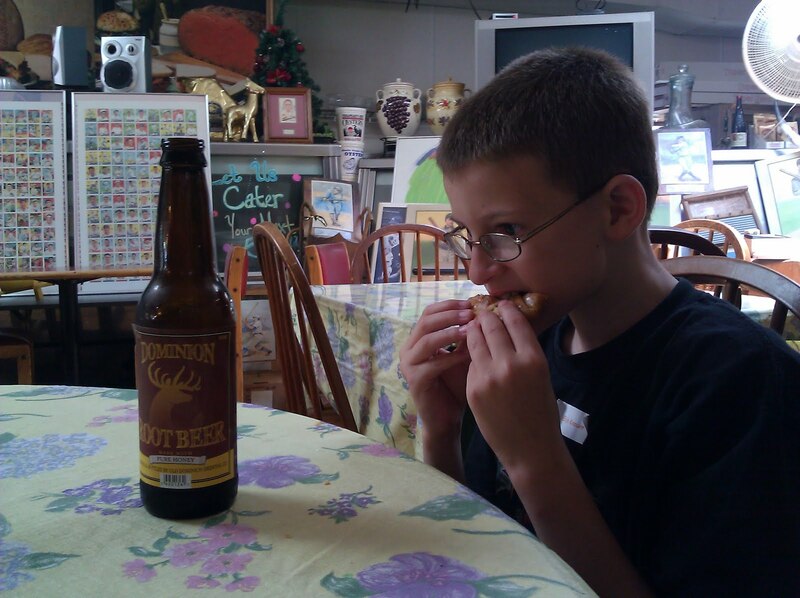 We also didn't have a drink, so we got a special type of root beer from the store called Dominion, which was sweetened with honey instead of sweetener, which is what most root beer is sweetened with. The root beer was great! It tasted a lot like Virgil's, which is another brand of root beer. The empanada was also delicious! It tasted a lot like pizza, my favorite food. I give ***** stars for food. I'm not doing kid friendliness because the food didn't come from a restaurant. I have one more thing to say. By the time we got back to the Dangerously Delicious, they didn't have what we wanted! Well, that's all. Bye!